Its a master piece in its class glorifying your timeless beauty. Be your own style icon with captivating pink art silk lehenga choli. 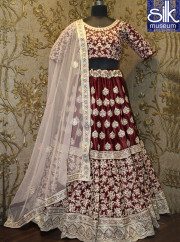 This lovely attire is looking extra beautiful with embelishment of embroidered, lace, resham and zari work. 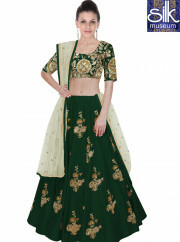 Comes with matching choli and dupatta. Slight variation in color, fabric & work is possible. This may happen due to multiple settings in your monitor or viewing device (Mobile/Laptop/Tab), or impact of our digital photo shoots. We request you to consider these minor color variations.Model images are only representative.Jewelry, Sandals and other Accessories wear by models in photographs are for display purposes only.